Forever Nigella: Royal Street Party! I’m big on any excuse for a food holiday. Couple that with wanting to participant in the Forever Nigella blogging event: a Royal Street Party (hosted this month by the incredibly talented and inspiring Mardi at eat. live. travel. write.). The challenge was to make finger food, selected from any of Nigella Lawson’s cookbooks. This all came together around a mini-royal wedding reception / barbeque I had last night in honor of the happy couple, William and Kate. I remember the Royal Wedding of the last century: Charles and Diana. That summer, I was living in a fraternity house at the University of Pennsylvania with my friend Gail, her sister Linda, and some of Linda’s friends, and there were some boys, of course. Linda and her friends were students at Penn. I lived the first half of that summer with my grandmother in her apartment a dozen blocks away. While I enjoyed hanging out with my Gram at the end of my days working as a secretarial temp, I craved the company of my peers. When a room opened up at the frat, I moved in. Diana and I were the same age, so I felt some connection with her. I remember we girls woke up oh-so-early and watched the entire wedding on a black-and-white television set with a screen the size of an iPad. We marveled at the bride’s dress, the pomp and circumstance, and the hats, of course. Some things just don’t change. As William and Kate embark on their royal lives together, I hope that their fairy tale will end with “happily ever after”. For our home celebration, I picked a savory appetizer and dessert from Nigella Express. Subtitled “Good Food, Fast”, the recipes in this book live up to their billing. Both of my choices were incredibly quick to put together, less than an hour of effort on the wedding eve. We started with Smoked Trout Pâté. 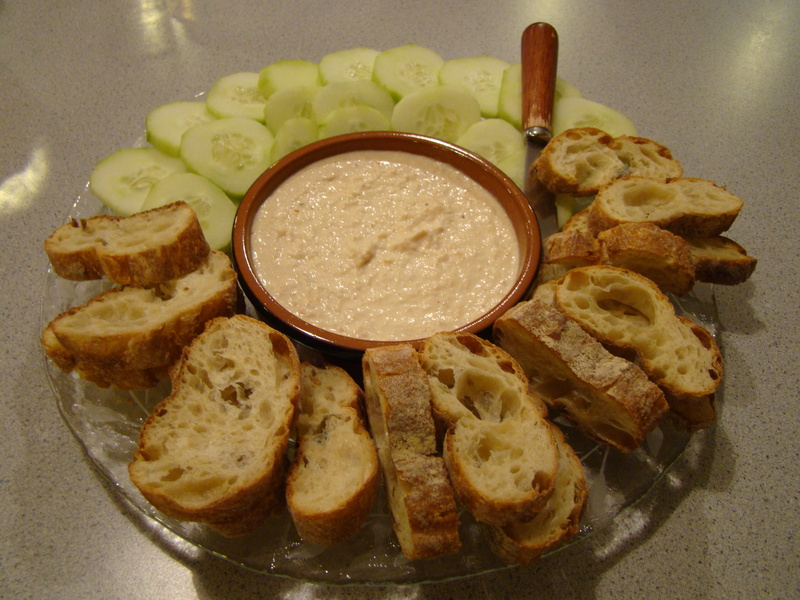 I served this smooth fishy spread with toasts and cucumber slices. It was the perfect accompaniment for our Pimm’s Cups. I miscalculated the amount of cream cheese I had, but substituted Greek yogurt to make up the difference. I suspect this didn’t change the flavor significantly. Dinner was lamb burgers with a quinoa, tomato, olive, and feta salad (my recipe, not Nigella’s) and steamed asparagus. To continue to royal theme, we drank kir royales, champagne with crème de cassis. Nigella reappeared for dessert. I adapted her Cherry Cheesecake to mini-cakes topped with multi-berry conserve for eating out of hand (Street Party style). The cheesecakes tasted fine, though they were a little messy for eating as little tastes. For this recipe, I think the original rendition, as a whole cake sliced to serve, would have been easier to eat. Overall, we enjoyed having special, though informal, food for a special occasion. It was an fun-filled evening of lively conversation and good company. Who could ask for a better way to end the week? Posted on 30 April 2011, in Forever Nigella and tagged cheesecake, forever nigella, royal wedding, smoked trout. Bookmark the permalink. 8 Comments. Your mini-cakes look delicious! Great choices! I love hearing about ways we mark special moments! Your street food looks great! I enjoyed knowing that in years to come the kids, especially the 10 and 13 year old, will remember sitting together and watching this moment in history! Just the way you and I both have our memories of the Diana and Charles wedding! What a great Royal Wedding celebration dinner, Betsy. Everything looks and sounds so delicious. I am so glad that you watched the wedding – wasn’t Kate’s dress gorgeous? And I enjoyed looking at all the hats! So fun! I’m glad your party was fun! Great party food – it’s asparagus time in UK so that’s spot on. What a lovely spread. nice finger food for a street party! 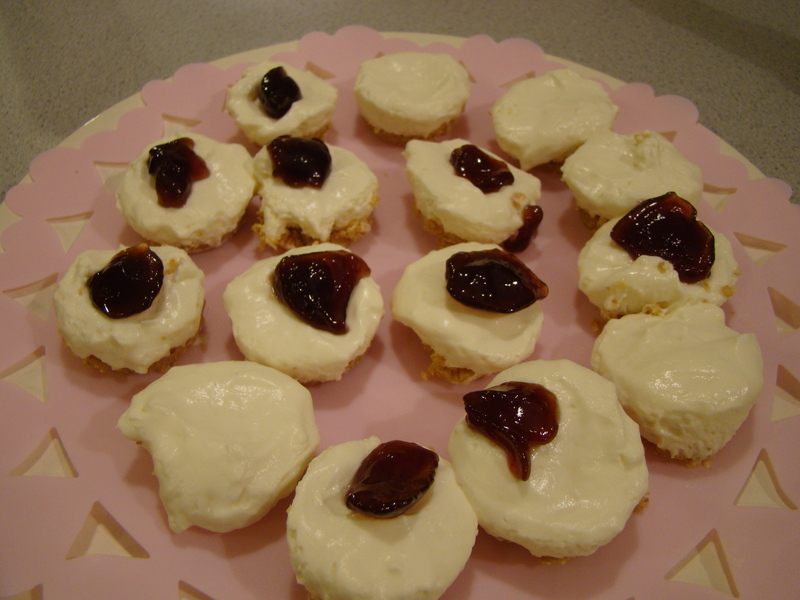 I love your mini Cherry Cheesecakes! They look delicious!